Welcome to the wonderful state of Oregon, a beautiful slice of the Pacific Northwest as well as a place of interesting marijuana smoking laws. Whether you’re a citizen or just visiting, it’s very important to understand Oregon Marijuana Laws, so you know what you can and cannot do. This information could be the difference in whether or not you receive anything from a hefty fine to some jail time. Luckily for those in search of marijuana’s health benefits, Oregon is one of the few states in the United States that has more relaxed marijuana legislation. The passing of Measure 91 allows recreational dispensaries to open and conduct sales. Adults 21 and up are able to buy and carry marijuana legally. There are, however, some discrepancies. Marijuana possession laws in Oregon vary for the use of marijuana at home (private) and outside your home (public). This means that, if you’re using anything and everything including marijuana, edibles, and other cannabis supplements, you should be intimately familiar with Oregon’s laws. The most popular concern is possession; the amount you can carry also differs depending on whether you are an Oregon Medical Marijuana Program cardholder or caregiver. 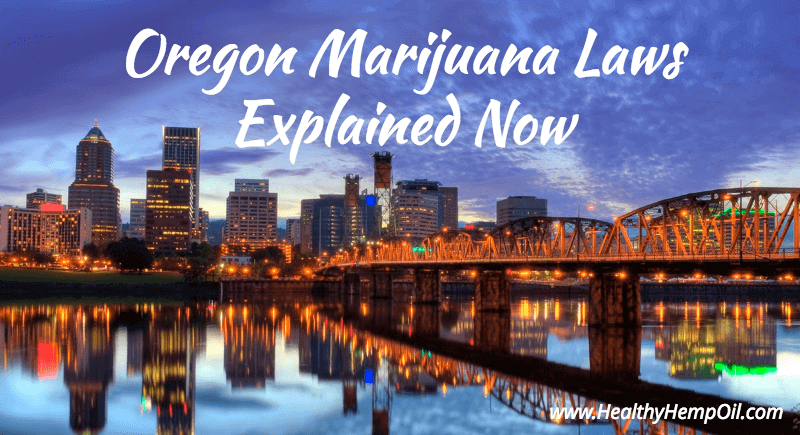 In this guide, we’ll go over everything you need to know about marijuana in Oregon. As one of the first states to legalize recreational and medical marijuana, Oregon has had a decent chunk of time to develop laws integrating the legal and safe use of marijuana into society for those who choose to use it. But to be on the right side of the law, it’s important you understand the different types of marijuana laws and any associated penalties. Different laws apply to consumers, sellers and distributors as well as medical marijuana. Oregon’s marijuana possession laws are largely in favor of the consumer, but they still have limits. Consumers who find themselves knowingly or unknowingly carrying above the limit can be hit with a ticket and a violation or even a misdemeanor. Remember, the legal age in Oregon for marijuana use and possession is 21 years old. If you are 21+ and in a public area, you are allowed to carry the following. If you are in your private residence or property, you are allowed to have up to 8 ounces of cannabis in a usable form such as a dried flower. All the other limits, however, stay the same. The penalties for carrying over the legal limit range from $650 and no incarceration to $6,250 and up to a year of incarceration. This is why it’s important to know the limits and avoid any possible penalties or jail time. We’ll get into more detail about the penalties later. One of the great things about the marijuana world in Oregon is that many of the dispensaries are extremely knowledgeable about the purchasing limits. People who work at dispensaries are usually very friendly and happy to help you understand how much you can purchase. They can also answer any other questions you may have about Oregon Marijuana Laws. Since these dispensaries have to go through a rigorous approval process and must follow strict guidelines, workers’ knowledge and advice is usually very well-founded. However, it couldn’t hurt to familiarize yourself with Oregon’s marijuana purchasing laws just in case. Again, you must be at least 21 years old with a valid government-issued ID to purchase any cannabis or cannabis products. Cannabis products include flowers, seeds, edibles, concentrates, clones, or any other products containing cannabinoids. While the purchase limits are fairly generous, they still exist, and the penalties are real. 4 small immature cannabis plants. You may notice a similarity between this list and the amount of marijuana or marijuana products that you can carry and possess. Essentially, you can’t walk out of a single dispensary with an illegal amount of cannabis or cannabis products. However, if you choose to visit a bunch of different dispensaries and buy up to the limit, you can still end up carrying beyond the limit, and you will be subject to the penalties and fines noted in the possession section. If gifting recreational cannabis in exchange for any of the above financial considerations, the transaction is no longer deemed a gift and is considered illegal. Please make yourself aware of the above stipulations and keep yourself on the right side of the law. When the time comes to purchase marijuana or marijuana products, it’s useful to know when dispensaries are actually open. Measure 91 authorizes licensed retailers to dispense marijuana to adults over 21 years old between 7:00 AM and 10:00 PM PST. Be sure to plan ahead so you don’t get stuck without the products you want after the stores have closed. Additionally, store owners have the right to operate at any time within these designated hours, so double check with the actual location (Google Maps is a handy way to get their phone number) to confirm open hours. It’s also important to note that the following cities have banned recreational marijuana sales. Possession is still allowed, though, regardless of whether a county or city forbids recreational marijuana stores. Possession is still legal, but be sure to plan in advance to see if the city or country you are visiting or living in allows recreational marijuana sales. Oregon Marijuana Laws forbid smoking marijuana in public, and getting caught could get you a hefty fine or even jail time. So with that, it’s important to go over what “public” means in the eyes of the law. “Public” property covers all the obvious outdoor areas like community parks, buses, airplanes, and general public areas. It’s pretty safe to assume that any area that isn’t your private home or that of your friends is likely public property. A few areas that get confused with private property that could get you in trouble include bars and public smoking areas. While these locations may seem private enough to smoke marijuana, in the eyes of the government, it is still illegal. Keep in mind that, even if you’re smoking through a discreet little vape pen, it’s still illegal, and you could still get hit with fines and jail time. Driving Under the Influence (DUI) refers to operating a motor vehicle while impaired by alcohol or other types of drugs. Since the legalization of marijuana in a few states is relatively recent, many people, particularly first-time marijuana users, aren’t as clear that driving while under the influence of marijuana can still get you in substantial trouble. The State of Oregon says that driving with any amount of THC in your system warrants a DUI charge. This is kind of tricky because THC stays in our system long after the effects of marijuana have worn off. THC stays in the body for about 30 days, and it can be pretty hard to prove whether or not you smoked just before or while deciding to hop behind the wheel of a car. This is why it’s important to take extra precautions to not drive after you smoke at all. Officers are very well trained to look for telltale signs of being under the influence of a variety of substances, and marijuana is one of the most popular and easiest to tell. By avoiding smoking and driving altogether, you can avoid turning what would have been a possible warning or minor infraction into a DUI. If you’re caught driving under the influence of marijuana, you could end up dealing with unpleasantness such as getting your driver’s license suspended, hefty DUI fines, jail time, and even an ignition interlock device to be installed in your car at your expense. The State of Oregon has been pretty intolerant of people who choose to drive under the influence of marijuana, and it considers any presence of THC to be evidence of impairment. So, you want to take some of your marijuana or marijuana products to one of Oregon’s many beautiful national parks? Think again. While the State of Oregon has largely legalized the use of marijuana, the federal government still deems it illegal. This means that possession of marijuana on any federal land is against the law, and you could end up getting hit with a serious fine. And this won’t be a fine of a few hundred or thousand dollars as per Oregon State possession fines. A federal fine will be to the tune of $250,000 as well as jail time. Federal law forbids you from consuming, transporting, possessing, and growing marijuana on any federal lands managed by federal agencies such as the Bureau of Land Management and the National Parks Service. To clarify, marijuana is still illegal as far as the federal government is concerned. This does raise a few confusing areas, such as marijuana use within “legal” states but on federal ground. This is why it’s important to familiarize yourself with not only the state laws but also the state maps. You don’t want to get caught unknowingly driving through a national park with a few ounces of marijuana or marijuana products in the trunk. So, that brings up the question, “Can I smoke or consume marijuana or marijuana products at my hotel or motel?” This subject naturally brings up a lot of ambiguity on the side of both the consumer and hotel & motel operations. Since the use and sale of marijuana has been legalized in Oregon, the interpretation of what is a “public place” has continually been discussed. In case of any lack of clarity, let’s go over how the law defines what a “public place” is. So, here we have a bit of a narrower focus of where you can legally consume marijuana. The law explicitly states that you can’t consume marijuana in places the general public has access to – specifically in this situation, the hallways, lobbies, and other parts of the hotel and motel other than the rooms designed for actual residence. Whether or not you can use marijuana or marijuana products within the room is open to interpretation. The law’s definition doesn’t disallow the use of marijuana within the room as long as it isn’t public in nature and is designed for actual residence. Now, whether or not that specific room is designated as a smoking or non-smoking room raises another round of questions. Here, we’ve zeroed in on a slightly less authoritative ruling system, away from the federal and state governments and down to hotel or motel policies. Hotel and motel facility owners retain discretion to allow or prohibit the recreational use of marijuana in their hotel or motel rooms. This means that, while the Federal and Oregon State governments don’t explicitly forbid you from smoking marijuana or eating marijuana products within a hotel or motel room, the lodging facility owners have the right to say yes or no. While the absence of any federal or state restrictions relieves some tension, it’s still useful to check the policies of your hotel or motel. It’s best to call directly; many hotels or motels in Oregon are chains and might not have been keen enough to update their policies specifically for the State of Oregon. Additionally, the Indoor Clean Air Act, commonly known as the Smokefree Workplace Law, prohibits smoking in the workplace as well as within 10 feet of all exits, entrances, windows, air-intake vents, and accessibility ramps connected or leading to an exit or entrance. The relevant stipulation is that hotels and motels are allowed to designate up to 25% of their rooms as smoking rooms. The decision of whether or not to designate the rooms as such is entirely up to the lodging facility owner. If a lodging facility would like to allow the use of recreational marijuana in one of their rooms, they can only explicitly do so in the rooms designated as smoking rooms under the Indoor Clean Air Act. If a lodging facility were to allow smoking in a room that wasn’t designated as a smoking room, they wouldn’t technically be violating any Oregon Marijuana Laws, but they would be going against the strict requirements of the Indoor Clean Air Act. Again, we head into yet another layer of law, this time regarding the use of medical marijuana in hotel and motel rooms. This subject is going to require looking at the “reasonable accommodation” statement in the Americans with Disabilities Act. Looking at a case decided by the Oregon Supreme Court in 2010, the answer to whether or not you can smoke medical marijuana and are protected by federal and state law is likely “no”. (2) This mainly because marijuana, whether medicinal or recreational, is still considered an illegal controlled substance under federal law. However, it’s worth considering that this case law dates back to 2010, and there has been a lot of evolution since then in how state and federal governments look at medical marijuana. As of October 1, 2015, state-licensed medical dispensaries in the State of Oregon have been able to sell to recreational users over 21 years old. After that, Oregon started to regulate all retail marijuana sales of all licensed entities. All regulations concerning the commercial sale, processing, and production of cannabis and cannabis products are overseen by the Oregon Liquor Control Commission. Perhaps the most relevant thing to note is that dispensaries are limited to selling adults up to a ¼ ounce per day per visit. Any unlicensed entities are subject to possession penalties and fines. The Oregon Liquor Control Commission has been accepting applications for individuals to sell, process, and grow marijuana for personal use since January 2016. Adults are allowed to grow up to 4 cannabis plants at home without any penalties and fines provided the plants are grown out of public view. Possessing any more than 4 plants is considered a misdemeanor, which comes with a fine of $2,500 and/or up to 6 months in jail. Places that grow marijuana in Oregon must also pay a $200 fee, which can be reduced for low-income users. Home growers cultivating marijuana for personal use must also pay a $50 grower fee. All growers are also subject to background checks. The manufacturing of cannabis in any amount is considered a felony in the State of Oregon with fines up to $1,250 and up to 5 years in prison. Additionally, anyone caught manufacturing cannabis within 1,000 feet of school grounds could be charged with a felony, which is punishable by a fine of up to $375,000 and 20 years in prison. The only two exceptions to this include home gardens with up to 4 cannabis plants and licensed medical marijuana grow and production sites. While there are no penalties or fines associated with delivering less than a single ounce of homegrown cannabis without financial consideration (see above), any more than that weight is trouble. Here are the penalties you could face. Delivering 1-16 ounces is a Class A violation, which includes a fine of up to $2,000 with no jail time. Delivering 16+ ounces is a misdemeanor, which includes a fine of up to $6,250 and/or up to 1 year in jail. Delivering any amount within 1,000 feet of any school grounds is a felony, which includes a fine of up to $375,000 with up to 20 years in prison. Additionally, anyone who delivers more than 150 grams of cannabis is subject to punishment by the State of Oregon regardless of whether they received compensation. Recreational marijuana has been legal in the State of Oregon for a few years. Oregon has one of the few governments friendly to recreational marijuana. The following are some of the most frequently asked questions concerning the use of marijuana in Oregon. Who can buy recreational cannabis in Oregon? Anyone over 21 years old is legally allowed to buy and use recreational marijuana. You don’t necessarily need to be a current resident of Oregon to legally purchase recreational marijuana, but you will have to prove your age with a government-issued ID. You don’t need a special card for recreational marijuana purchases. Where can you legally buy recreational marijuana in Oregon? How much recreational marijuana can you legally buy in Oregon? 1 ounce of cannabis in usable form such as a dried flower. If you are a registered Oregon Medical Marijuana Program cardholder or caregiver, you can buy up to 4 ounces of usable cannabis. How much will recreational marijuana cost in Oregon? Costs vary from place to place, but the price of recreational marijuana usually hangs around $10 to $20 per gram depending on the quality of the marijuana. Can you buy edibles in Oregon? How is recreational marijuana taxed in Oregon? When OLCC-regulated retail stores started coming out in 2016, the state started to impose a 17% tax on all retail sales. Local cities and counties are able to impose up to a 3 percent tax on all purchases at retail stores. To get approved to sell marijuana in the State of Oregon, you must go through the OLCC. (7) There is no paper application, and you can only find the application online. You do not have to be an Oregon resident to receive a license. To be eligible for a recreational marijuana license, you must be over 21 years of age and meet all the requirements outlined in the OLCC Division 25 rules. It usually takes around 2 or 3 months to process a license application once it has been assigned to an investigator. Background checks are done by Fieldprint (with the Oregon State Police). Once an investigator has been assigned to your application, they will notify you when it’s time to get your fingerprints taken. There are currently six different types of recreational marijuana licenses: Producer, Processor, Wholesaler, Retail, Laboratory, and a Certificate for Research. Applying for each license type requires a non-refundable application fee of $250. Producers are also referred to as growers. The licensing fees for producers vary and are categorized into four different tiers. Processors are the businesses or individuals that transform raw marijuana into different products such as edibles, concentrates, extracts, or topicals. The licensing fee for processors is $4,750. Wholesalers are businesses or individuals that buy marijuana and/or marijuana products in bulk and then sell to licensees. Wholesalers do not typically sell directly to consumers. The licensing fee for micro wholesalers is $1,000. Retailers are the businesses that sell marijuana or marijuana products directly to consumers. The licensing fee for retailers is $4,750. Laboratories test marijuana and marijuana products based on the Oregon Health Authority rules. To get a laboratory license, your lab must be accredited by the Oregon Environmental Laboratory Accreditation program. The licensing fee for laboratories is $4,750. So, the process of becoming a licensed medical marijuana dispensary is relatively clear. Every proposed medical marijuana dispensary or processing site (including all the owners and PRDs and PRPs in the application) has to go through a background check. This background check is done by fingerprint scanning per state law. This background check comes with a fee of about $35 for every individual in the initial application. If you add a new owner or change a PRD/PRP, you will have to pay the $35 fee again. These payments can be made by check or money order (payable to the Oregon Health Authority) or sent by mail and received by the Oregon Medical Marijuana Program. You must also pay an application fee of $500 as well as a license registration fee of $3,500. Keep in mind that no one who has ever been convicted for the delivery or manufacture of a Schedule I or Schedule II substance in any state can be listed on the application. Police are finding more drivers driving under the influence of marijuana. This is shown to be correlated with the legal access to the substance. However, many of the drivers may be unaware that marijuana is considered an inhibitory substance and that any THC present in their system can result in a DUI, fines, and suspension of their driver’s license. This is why it’s extremely important to not only understand and know the laws of the land yourself but to communicate them to people that may not know. Much remains unknown about the impact of legal marijuana on public health in Oregon. While certain studies may reflect positive benefits of legal marijuana in private use and private health, there simply isn’t enough data to make any assumptions about the impact of legal marijuana on public health in Oregon. Many communities, especially in eastern Oregon, remain opposed to recreational pot. There are still a bunch of communities clustered in eastern Oregon that are opposed to recreational marijuana and have chosen to not allow recreational dispensaries. While recreational use is still legal in the entire state in the privacy of your own home or residence, it’s illegal to use in public areas. Hundreds of Oregonians with marijuana-related arrests and convictions are seeking to have old cases set aside. With the legalization of marijuana comes the flood of cases that have to do with marijuana-related convictions and arrests. This has opened up a ton of work for the State of Oregon. Research linking cardiovascular death and marijuana is far from conclusive. While there are currently countless studies looking at the effects of marijuana and its impact on virtually every part of the human body, the majority of them provide inconclusive evidence. Big profits fuel risk. The legal cannabis market in the United States was worth $7.2 billion dollars in 2016. (9) Since there are only a handful of legal states, tons of people from all over the country have decided to relocate to states such as Oregon to chase a slice of the pie. This naturally fuels the potential risk associated with the industry. Oregon’s marijuana industry is raising land-use tensions. (10) With over 685 producers licensed by the state to grow marijuana and over 800 applications pending, land use tensions have naturally started to spring up between traditional farmers and the new marijuana crop growers. While these tensions are currently relatively tepid, they could become a larger issue in the future. Regardless of whether these disadvantages are merely signs of a community adapting to the change in legal policies, recreational marijuana users must make the effort to have a more positive impact on the State of Oregon. The legalization of cannabis in Oregon has also brought about some interesting conflicts with federal drug law. The same substance that is completely legal to possess and carry in Oregon can get you arrested just a few hundred miles east. Many of these conflicts center on issues such as physician liability, law enforcement, business operation, and possession. Since the legalization of marijuana is still a relatively recent thing, there is a lot of work to be done within the state and at a federal level. Oregon Marijuana Laws for minors are still relatively strict. The State of Oregon states that you must be at least 21 years or older to purchase and possess marijuana. Minors caught possessing or using marijuana can be hit with a variety of charges including a Minor in Possession as well as other criminal charges. The fact that there are numerous counties and cities banning recreational marijuana sales highlights the divide concerning recreational marijuana. Though only at a municipal level, tolerance for recreational marijuana varies across the state. The line essentially divides the state in half and creates an interesting dynamic for recreational marijuana users. Those people living in the east, where the majority of counties and cities that have banned recreational marijuana sales are, can simply drive a few hours west to purchase the legal limit and then drive back. Today, this serves as little more than an inconvenience. In the future, however, if the divide in policy between counties and cities continues to become more heated, things could be different. Minimally regulated medical marijuana operations are also limited to 12 plants, and anyone growing more than that will have to follow the OLCC’s “seed-to-sale” tracking system. This shows a further government initiative on the product side: control of growth, distribution, and sale. This entry was posted in United States CBD Policy and tagged Oregon.